Leah explains the Prices’ problem: if they turn down Tata Ndu’s offer of marriage, Ndu will be very offended. This wouldn’t be good for the Prices, since Ndu is such a powerful leader. Meanwhile, Leah comments on the system of government in the village: the Belgians had always used a voting system, but the villagers didn’t like this. As they saw it, democracy could leave 49 people out of 100 unhappy, simply because of the 51 other people. Instead of democracy, the villagers make deals with each other, until everyone is somewhat satisfied. The Prices are in a genuine moral dilemma: they need to survive with Tata Ndu’s blessing, but they also don’t want Rachel getting married to him. The moral ambiguity of this decision mirrors the ambiguity of the election process: there’s no ”right answer,” just the answer that pleases the most people. And yet the people of Kilanga don’t practice democracy; they prefer a localized system in which everyone reaches one compromise. Rachel is furious about the possibility of marrying Tata Ndu. Whenever Tata Ndu visits from now on, she makes herself scarce. Orleanna and Nathan hit on the idea of pretending that Rachel is engaged to Eeben Axelroot. Word gets out that Rachel is “taken,” and Ndu stops visiting. As in Leah’s explanation of voting, the Prices hit on a solution that is somewhat satisfying for everyone in the community: Tata Ndu is saddened but not offended by the information that Rachel is already engaged, and meanwhile the Prices get to continue living in Kilanga, albeit without the gifts from Ndu. Meanwhile, Ruth May isn’t doing well—she has horrible rashes all over her body. One day, the Prices are sweeping around Ruth May’s bed, and Orleanna discovers a huge number of malaria pills lying under the bed. There are 61 pills, exactly the number of weeks that the Prices have been in the Congo. Clearly Ruth May hasn’t been taking her pills, explaining why she’s been so sickly lately—she probably has malaria. Arn, Jackson. "The Poisonwood Bible Book 3, Chapter 36." LitCharts. LitCharts LLC, 29 Jun 2016. Web. 22 Apr 2019. Arn, Jackson. "The Poisonwood Bible Book 3, Chapter 36." LitCharts LLC, June 29, 2016. 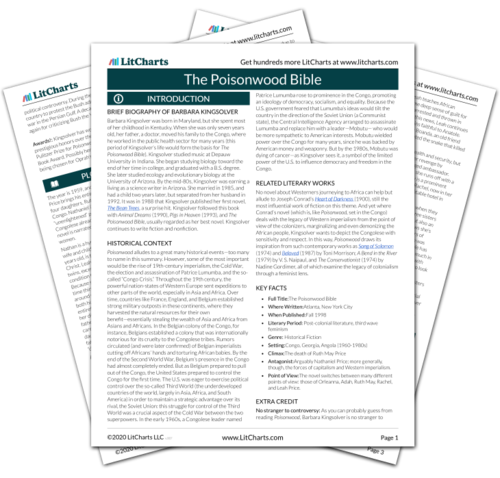 Retrieved April 22, 2019. https://www.litcharts.com/lit/the-poisonwood-bible/book-3-chapter-36.